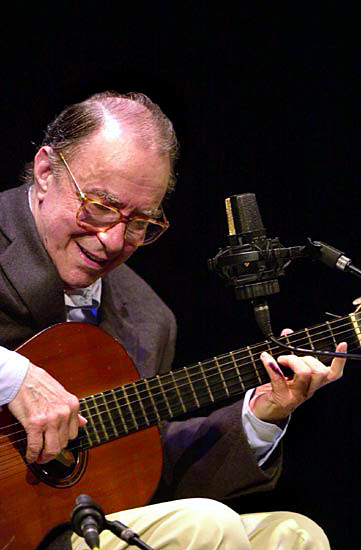 João Gilberto is the King Lear of bossa nova. As this once-majestic hero nears the end of his life, he is bereft and alone. His children bring battle against one another in the courts of law and in the press. Former allies (ex-wives, ex-girlfriends, ex-partners, and ex-lawyers arguing ex-parte) claim to represent his interests by pursuing their own. Old friends look on in helpless anguish, unable to get through to the fallen king. At the age of 87, Gilberto has lost nearly everything and spends his days holed up in a borrowed flat in Rio de Janeiro. Although he is only blocks from the beach, he rarely if ever sets foot outside. He opens the door only for delivery of takeout food—always the same dish from the same restaurant, if reports are to be believed. His daughter, Bebel Gilberto, has taken control of his legal affairs, against the wishes of his son João Marcelo, who has sued his sister for purportedly concealing information about their father’s assets. Both Bebel and João Marcelo are feuding with Gilberto’s former paramour Claudia Faissol, the mother of his youngest child, Luiza. Another former girlfriend, Maria do Céu Harris, has also occasionally served as Gilberto’s intermediary, either sheltering him from unwanted attention or cutting him off from his true friends, depending on one’s perspective. Gilberto owes fantastic sums to banks and tour promoters, primarily for accepting advances and then breaking his contracts. Gilberto himself has sued multiple recording companies in an attempt to recover the rights to the original masters of his first three long-playing records. There is no hope of these suits being resolved in Gilberto’s lifetime. When Columbia University presented Gilberto with an honorary doctorate in 2017, he canceled his trip at the last minute and refused to leave his apartment. Faissol called the fire department to break the door down, leading Gilberto to redouble his efforts to isolate himself. The few witnesses who have seen him recently report that he is gaunt, confused and fragile. How did it come to this? Gilberto was always a difficult person, by everyday standards. He was idiosyncratic and unconcerned with the constraints of etiquette. When he wanted to connect, he showed up unannounced. When he wanted to be alone he simply left, neglected to pick up the phone or declined to answer the door. His acoustic perfectionism was otherworldly, leaving him to walk offstage on numerous occasions when amplification failed to meet his exacting standards. In one famous 1999 example, at a sterile, cavernous São Paulo arena revealingly named Credicard Hall, Gilberto arrived two hours late and proceeded to complain about the air conditioning, the echo and the amplification. When the crowd began to jeer, Gilberto looked up and commented derisively, “Vaia de bêbado não vale.” (“A drunk’s boo doesn’t count.”) It was performance art, of a type. The avant-garde iconoclast Tom Zé took the incident as inspiration for a song of his own, “Vaia de Bêbado Não Vale”, reflecting on Gilberto’s titanic role in Brazilian history. Zé suggests that “bossa nova inventou o Brasil…bossa nova pariu o Brasil.” (Bossa nova invented Brazil…bossa nova gave birth to Brazil.) The apparent implication is that João Gilberto, having invented Brazil by changing its self-expression and its global image, deserves the benefit of the doubt when he complains about the amplification. But Zé then changes direction and closes with a celebration of the power and place of the boo. He cites another of Brazil’s great modernists, Augusto Campos, and his concrete poem “VIVA VAIA,” Long Live the Boo. Gilberto invented Brazil, Zé suggests. And the jeers of the well-heeled crowd, in an arena built to celebrate consumption, where music was an afterthought, were somehow necessary to confirm his greatness. Viva Vaia. Such is the power of Gilberto’s creative genius, and the renown of his disdain: even his curmudgeonly asides have played a generative role in the bricolage of Brazilian culture. Alas, this has not saved Gilberto from sliding towards self-imposed isolation. Indeed, it may have contributed to that isolation. It was understood long ago that Gilberto did not play by the typical rules of social interaction. It is not clear precisely when he made a transition from quirky standoffishness to physical and emotional inaccessibility. By the time he did, no one in a position to get close to him could pull him back into a broader network of friends and admirers. Bryan McCann is the author of João Gilberto and Stan Getz’s Getz/Gilberto, now available in the 33 1/3 Global series. Enjoyed what you’ve read so far? Check out the second new book in the 33 1/3 Brazil strand, Tim Maia’s Tim Maia’s Racional Vols. 1 and 2 by Allen Thayer – also published yesterday and on offer in our holiday sale.